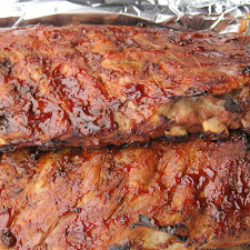 Easter is this weekend and many of you are already busy gathering up your ingredients for the big feast. In case you forgot about a centerpiece, here’s a quick and easy one to put together that will brighten up your table, plus be a conversation piece. 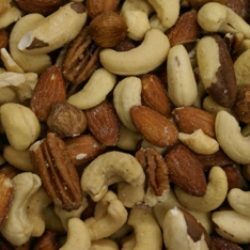 Once you purchase these containers you’ll have them for the next occasion that pops up. 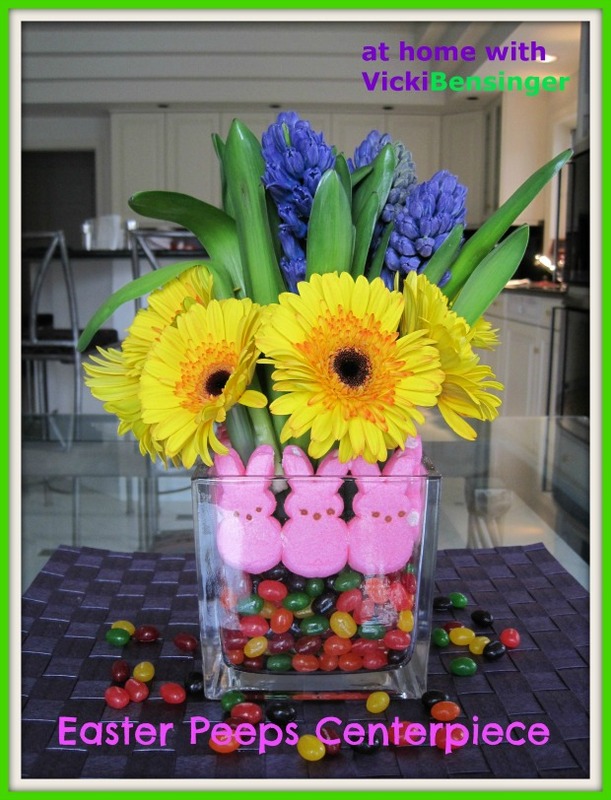 Create your own whimsical centerpiece – let your imagination go wild and be sure to let the kids help! 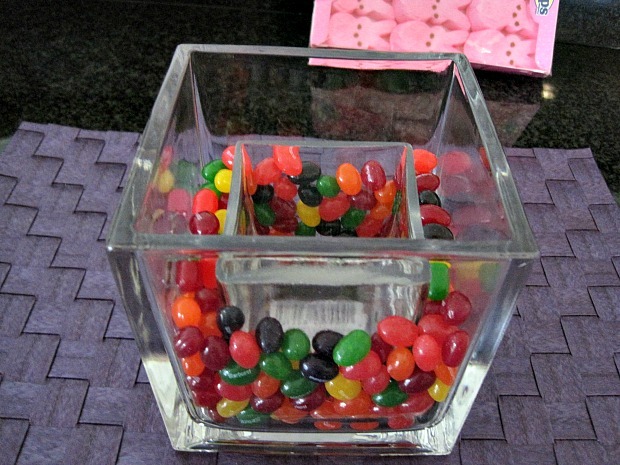 Center smaller vase inside the other and insert jelly beans (colors of your choice) between the walls of the cubes. 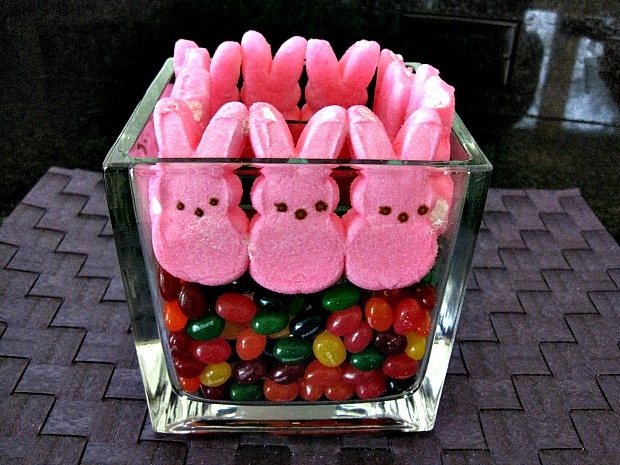 Place Peeps on top of jelly beans. Don't be afraid to squeeze them into the space. Fill the gaps if possible. Gerbera Daisies are sold with plastic tubes on the stems, perfect for supporting them. Keeping the plastic in place, cut the Gerberas and plastic if needed to desired length, along with Hyacinths, and arrange in vase. Flowers around exterior should be cut shorter than those towards the center of the vase….Select your favorite flowers! I used a 3 and 5 inch vase but you could also use the 4 and 6 inch vases or even rectangular vases. Whatever suits you. I’m lousy when it comes to floral arranging but this is easy. 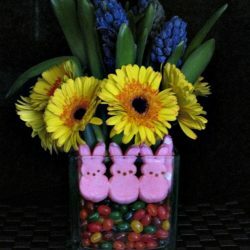 These vases can be used all year with various colored marbles, rocks, shredded colored paper, jelly beans, or candy of choice. 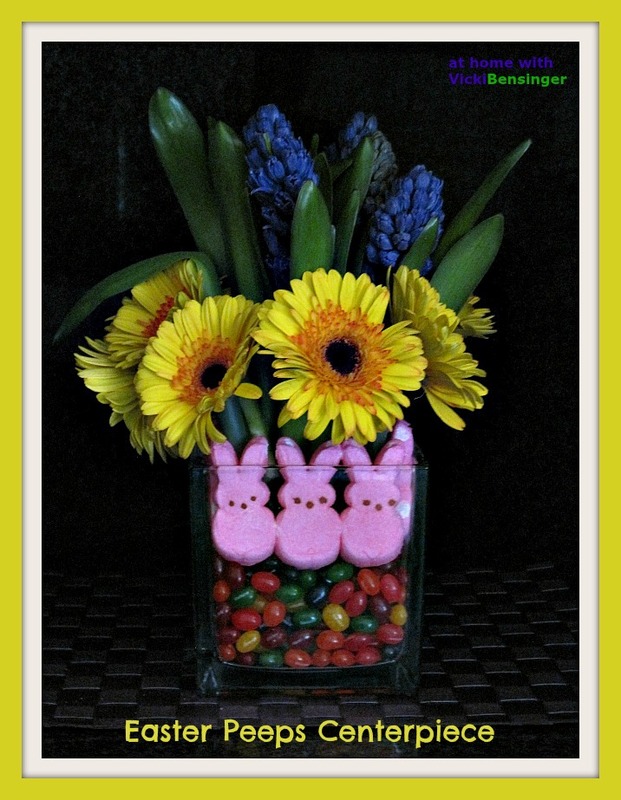 Then fill with your favorite flowers. The perfect low centerpiece anytime. Isn’t it adorable? I sure think so! What a cute idea!!! I get lazy when it’s just the 5 of us here for a holiday—but when the kids get married, I’ll do it right! Thanks for the inspiration!!! Can never resist peeps! Very nice — thanks. And Happy Easter!